This rum starts out with, Spank my booty and call me Martha but ends on a very flat note. Nice Mouth but the finish is a bit disappointing. Update, this rum has been sitting in the back of my rum cabinet just collecting dust, pulled it out for a dram and let it sit and breathe for 10-15 minutes and holy mackerel it has blossomed into a whole new drink. Very nice and excellent overall. Very smooth and silky. The best rum around. The way the rum should be. This is a rum that rank with others at half the price. I found this rum to be a bit too dry and it felt like it was too young. Not much to offer. 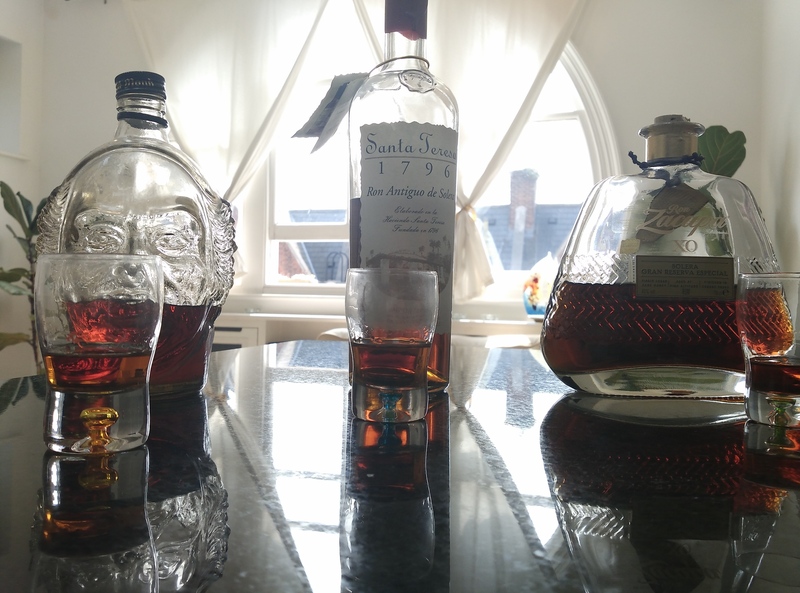 Had myself a tasting with the Angostura 1824, Atlantico and Santa Teresa 1796 and the problem for me was that I couldn't quite decide the better of the three. I found them too similar. Not as full-on flavoured as say Diplomatico Reserva, but the flavour comes more in the form of subtly sweet okay notes, and might be one of the most easy to drink rums I've had. Has absolutely no afterburn and is exceptionally smooth, if it was cheaper I could easily see myself necking most of a bottle in a night. Beautiful fragrant smell, smooth and pure taste. Points for the story and bigger picture. Best overall rum I have had to date. Un rom decent, fara ceva deosebit, seamana cu Flor de Cana, aspru, corpolent, cu gust de butoi foarte proeminent. Un profil aromatique sur un boisé très présent mais qui se marie parfaitement avec ses notes de caramel et de crème pâtissière. Il reste cependant assez sec. Il s'agit ici du seul rhum que je bois sur glace car je trouve que ça le sublime vraiment. I really enjoyed this rum , reminded me of Matusalem 15 (but better) and Millonario 15 (but not as sweet). Not a great deal of nose but a nice golden colour when poured. Very easy to sip neat and also with ice. Tried also with cola but didn't get any taste improvement. Gentle burn and nice exit , would buy again as quite reasonable. An excellent Venezuelan rum, to be permanent part of my "active collection" (my 10 best). I love this rum, and I believe is the best representative of Venezuelan rums. The BEST rum I tasted up to now ! Good balance between spices and lighter of the taste ! I could continue to drink it over and over ! Try to understand ! Picked up a bottle thanks to the warm recommendation of "Vlad" at my favorite liquor store. When I mentioned some other aged rums all I got was a grunt. When I pointed at the 1796 he started talking. 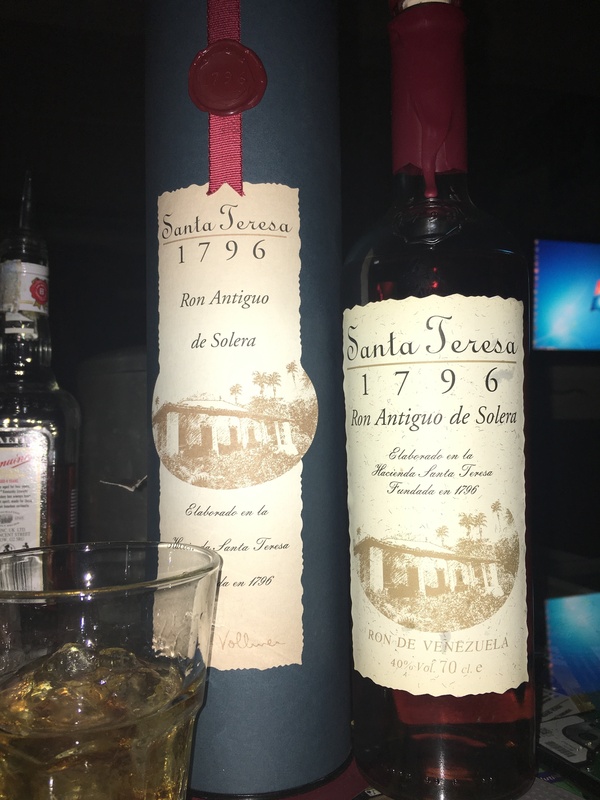 The Santa Teresa's got everything you want in an well aged rum. It's balanced towards the alcohol side (to me) but still fine to sip without any adulteration. The aftertaste is easy and lingers. I've only just started the bottle, but have tried and enjoyed it various ways. I seem to like it best with a single ice cube. This was one of my first favorite premium rums, and still is one my favorites today. This is an amazing sipper rum and also mixes well if you want to build an extra premium, high grade rum cocktail. It's truly an all-around versatile rum that most people will like and can be used in a variety of ways. It packs a punch but has an incredible, complex, and enjoyable flavor profile. It's also priced right and I can generally find bottles for around $50US. I try to always have this on hand in my rum cabinet, it's a sure crowd pleaser! I liked it from the first sip. Very balanced rum. Great nose. Smoothness. The finish is a bit short maybe with a spice, maybe clove. This rum has everything that a good rum sipper should have. It starts with some stone fruits and caramel notes but finishing dry and long. The solera gives it some extra depth in character and you can easily compare it with a great cognac or brandy de Jerez. Great value and for the more advanced palate. Along with the Diplomatico Reserva Exclusivo, dominates the 8 rating for me. Both are very smooth, great flavor, sweet but not over the top. Even people who aren't rum fans really enjoy this. Of course the price is amazing. This rum as other rums benefits usually from stay in the glas for some minutes to deliver right taste. It is not so sweet! recommended to the price around 45 euro! I love this rum...!! one of the best you will ever get...!! A fine solera rum, not too sweet which allows you to really appreciate the depth of flavours on the palate , in particular a fairly distinct taste of dark chocolate. A nice sipping rum, with Oaky and smokey taste. You can taste the Carmel a the rum goes down. A slight burning sensation ait goes down. I have added a small bit of water, which helps brings out the flavours of caramel and the spices. Well priced as well. Doux et riche j'adore ce rhum. Pas trop sucré il a un bel equilibr.